Since the start of the Missing Maps Project in 2014, there have been over 20,000 remote contributors mapping some of the most vulnerable communities in the world. All of the data created as part of this process is extremely valuable to the organizations who have requested it. One question commonly asked however, is about data quality. In our opinion, one of the greatest features of the Humanitarian OpenStreetMap Team (HOT) Tasking Manager is the idea of validation. As the number of volunteers that HOT provides this great service for grows, providing positive feedback to new mappers and catching any mistakes that all new mappers make early on is critical to retaining mappers and ensuring quality data for the communities being mapped. User dekstop, Martin Dittus, recently wrote a blog post highlighting the impact of positive feedback on recently mapped tasks for retaining new mappers. We’re all looking forward to reading the full paper! As an OSM user who creates HOT tasks, I constantly get messages from invested mappers who want to make sure they’re mapping correctly. I LOVE getting messages from users that show genuine interest in a project and are looking for ways to make sure they are making the most of their contribution to OpenStreetMap and the Missing Maps Project. I’ve also seen some negative messages and feedback. Everyone was once a new mapper, but it’s important to remember that if we want mappers to continue mapping and to improve the quality of data, condescension and negative comments won’t get us there. Let’s remember that we are part of a community of over 3,000,000 contributors and we all want to make a better OpenStreetMap. Currently there are nearly 500 Missing Maps projects. The tasks within them are, on average, 90% percent marked as done, yet the validation average comes in at just under 50%. We can do better. Message the project creator on the tasking manager. You can also leave comments in your task before you mark it as done or unlock it. Sign up for and send a message on the HOT Mailing List. Sign up for the new HOT Slack Community. If you’re a validator and you see a mapper doing a great job, reach out to them! Tell them they’ve got the hang of things and suggest that they start validating some simpler tasks. Remember all those great badges you can earn on your Missing Maps User Profile? We’re going to start reaching out to those users who have soared to great heights and have been earning their Task Champion badges, so that we can encourage users to start validating. Earn your Task Champion and Scrutinizer Badges! There is a great community willing to help you learn! See the list above about how to get in touch! In the coming weeks and months, a number of resources will be released by members of the Missing Maps community. Use these, give feedback, and ASK QUESTIONS. We’ll be sure to share them far and wide, as well as keep them safe and sound here on the Missing Maps website. There’s already a few resources available to help you out! We’ve also created a validation style for JOSM that you can download and apply to your downloaded area; it highlights some common issues to look out for when validating. Follow the instructions on the GitHub link to get started. Java OpenStreetMap Editor (JOSM) is a desktop editor for OSM and it will CHANGE. YOUR. LIFE. With helpful plugins and tools like the Buildings Tool and the Validation Tool, tasks that can be somewhat tedious in iD Editor become easier by leaps and bounds. There is a fantastic walkthrough at LearnOSM about learning JOSM. Spend a couple hours this weekend getting to know it! Finally, make time to validate. Earlier this year, we started #ValidationFriday. We use it as a reminder on every Friday to set aside some time to help validate a handful of tasks, giving positive and timely feedback to users. There are any number of great projects to choose from on the Tasking Manager. Find a simple buildings only task, read the instructions, square buildings, align them with imagery and ask for feedback on your validation. I’ve seen several instances of users starting to validate, and then asking another user either on the mailing list or Slack channel to check their work. That’s okay, in fact, I encourage that. 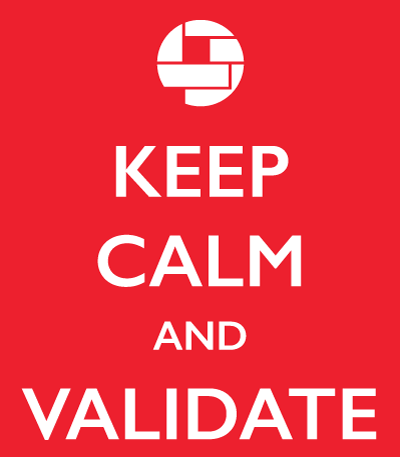 Don't forget to Keep Calm and Validate!